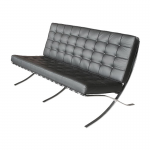 Our large black 2 seat sofa is based on the original Barcelona chair, designed by Mies van der Rohe in the late 1920s. Our stunning black Barcelona style 2 seat sofa provides heaps of comfort and it simply oozes understated, contemporary style. Our sofa is further complemented by contrasting metal legs, this is an iconic minimalist design that's effortlessly cool and is ideal for when you want to add a modern feel to your event. • Iconic designer style armchair• White leather with chrome frame and feet• Ide..